2.1 Whatever happened to Virtual Reality? In virtual reality we have an example of a ‘new medium’ (or at least a candidate for one) which was once as absorbing and hyped as the Internet but which, unlike the Internet and WWW, seems not to have delivered (however disappointed some have been in what they have delivered). 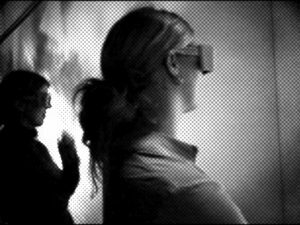 Nevertheless, throughout the 1990s, little can have exercised the minds and imaginations of technologists, journalists, artists, film directors, or academics as much as ‘VR’. How are we to account for this waning of interest; this ‘rise and fall’ of Virtual Reality within the short history of new media? From our present standpoint, we can now revisit the analysis that we undertook in 2001–2002. The populist hype, widespread experiment, the frequent conferences and artists’ projects that explored VR with such excitement through the 1980s and 1990s has waned. In an important sense it never existed. Apart from the reasons we gave in our original analysis (‘Is VR a new medium?) it is also now clear that the enthusiasm for VR was part of the euphoric techno-utopian expectations of the period, and the heady mix of the computer counter-culture and neo-liberal Silicon Valley entrepreneurship – a period that was brought to a fairly abrupt end by the dotcom bust of 2000 (See Section 10). Is VR a new medium? While ‘immersive VR’ has been thought of as a ‘medium’ we should be cautious in doing so. It may be more accurate to see VR as a prime example of a technology (or collection of technologies) which is a stage where development and investment are taking place for a variety of speculative reasons. However, whether the technology merits the status of a visual ‘medium’, in the widely accepted social sense, is open to question. An important way to understand a medium is as a set of social, institutional and aesthetic (as well as technological) arrangements for carrying and distributing information, ideas, texts, and images. Immersive VR has no firmly settled institutional pattern of distribution, exhibition or use and for this reason it is difficult to describe as a medium in a fully social sense. A medium is more than the technology it depends upon; it is also a practice. It is a kind of skilled work on raw materials (whether they be words, photographic materials or digitised analogue media) which uses conventions, structures and sign systems to make sense, to convey ideas and construct experiences. The jury must still be out on whether or not VR will ever achieve the status of a medium in this sense. Whether, in other words, it will become a form of social communication and representation in the manner of radio, cinema or television. We have already briefly discussed Stone’s conviction that immersive or simulational VR will fuse with online forms at a future time to become a medium of a new and dramatic kind. The important point here is that neither visionary speculation nor sheer technological potential is itself a sufficient guarantee that a medium will actually be the outcome of a technology.